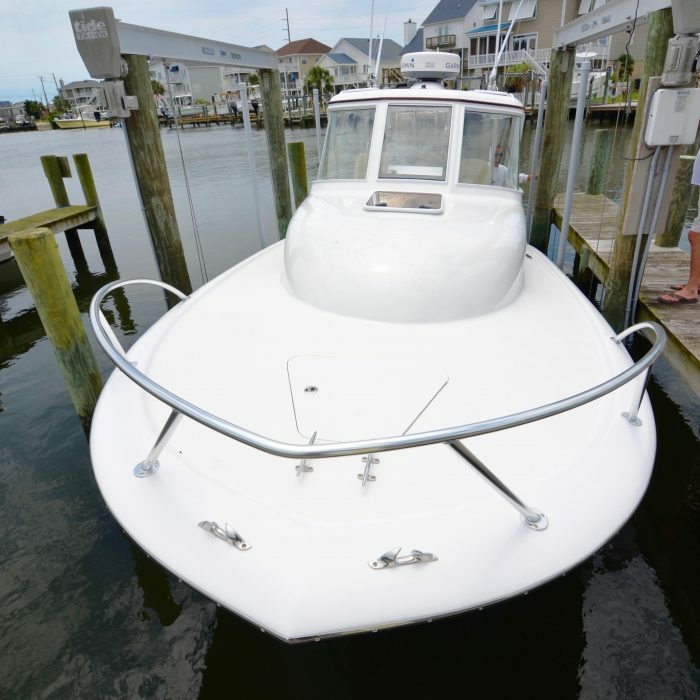 The Winter 27 retro express is a unique vessel. 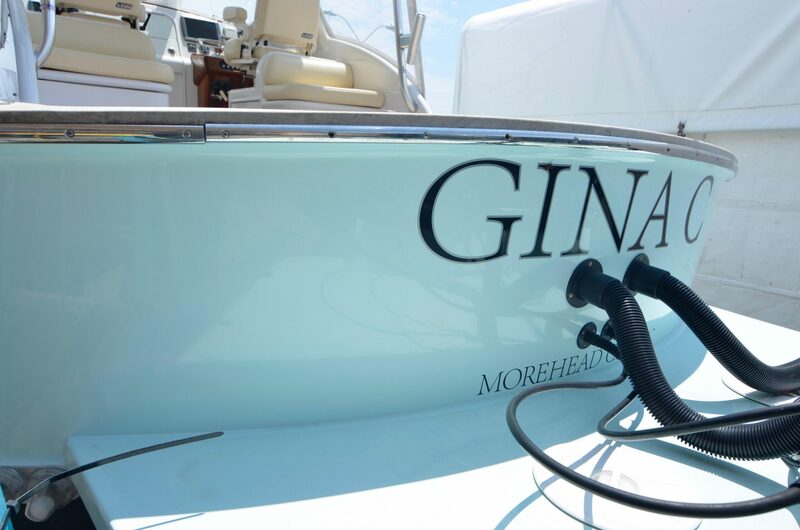 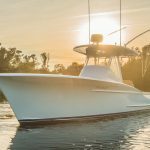 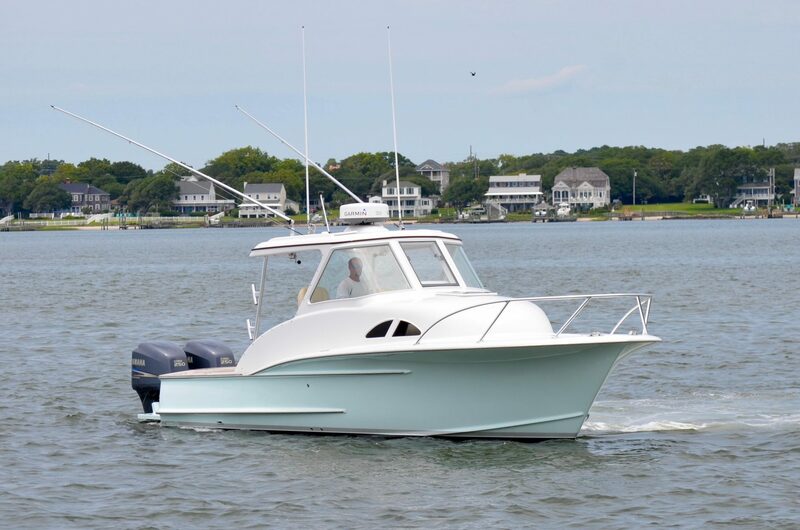 She is a mashup between the classic Carolina hull and the legendary Rybovich designs. 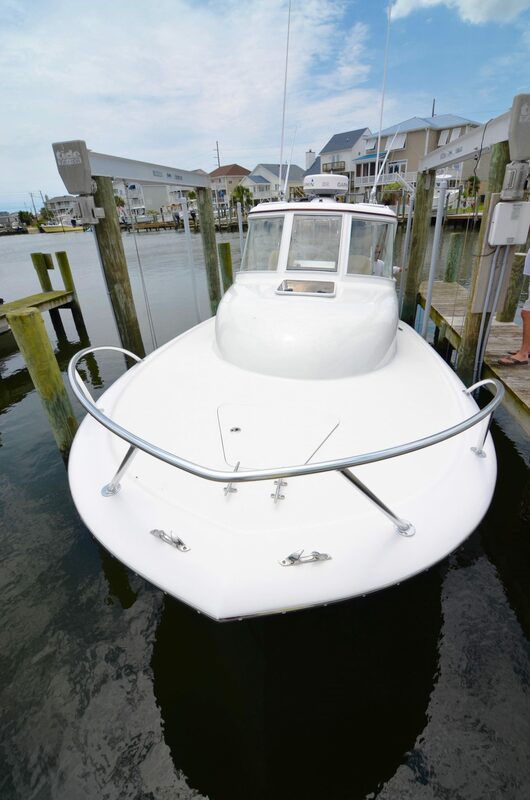 This boat was built to cruise the waterways along the eastern seaboard down to the west coast of Florida. 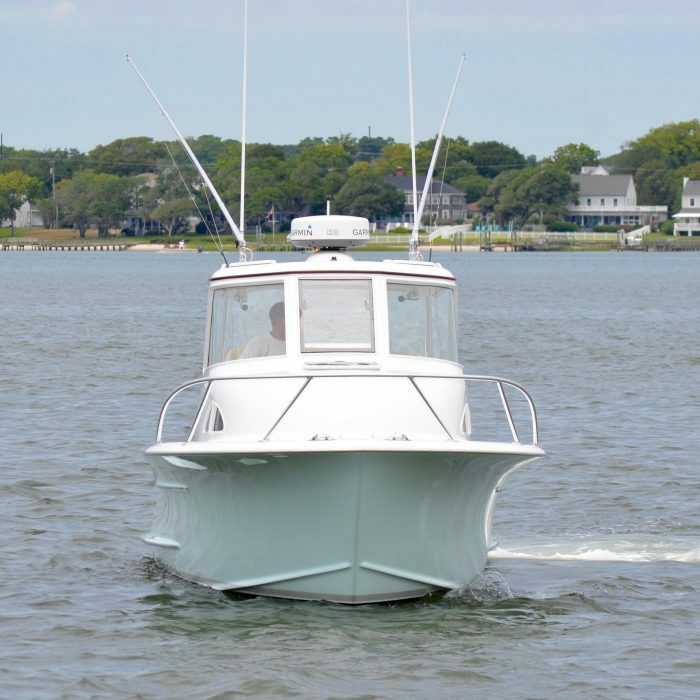 She has been rigged to fish along the way and offer the most flexibility to travel and fish along the journey. 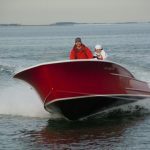 The classic design was a challenge for us to build and pull off the proportions on such a small platform. 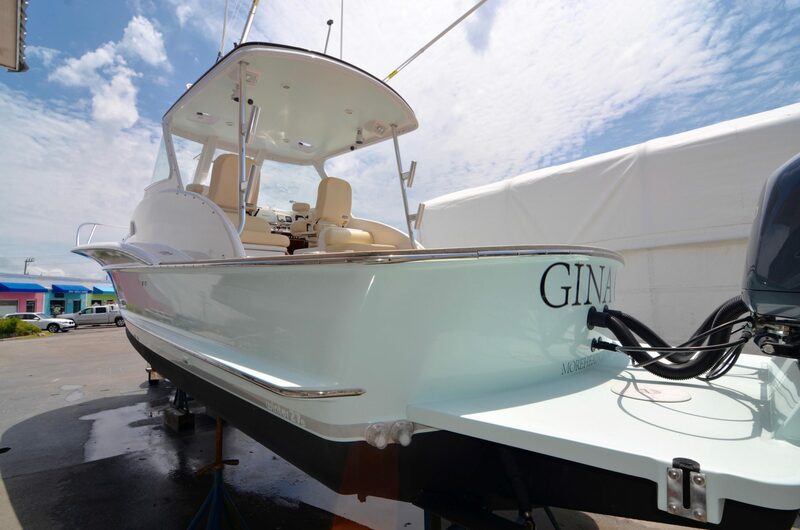 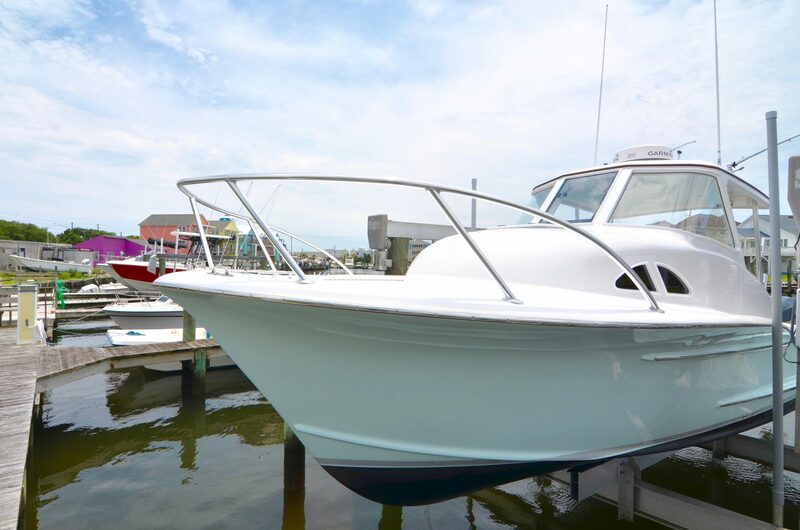 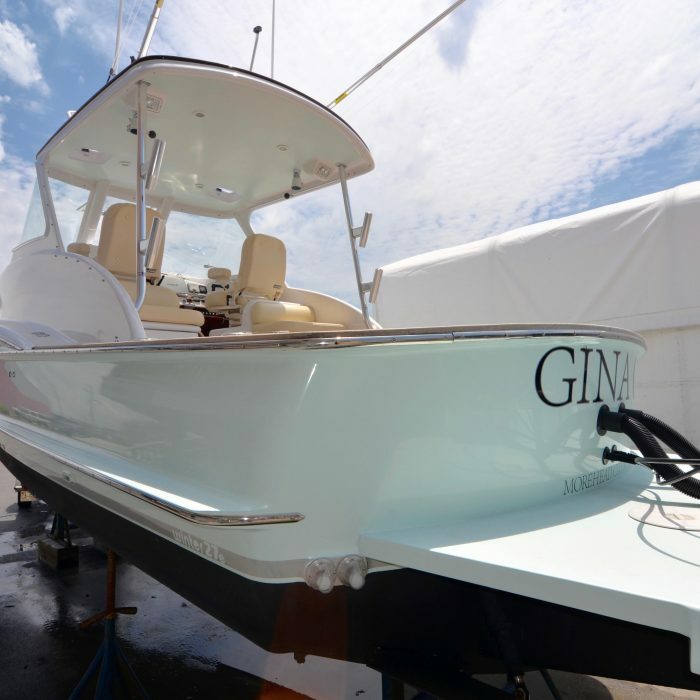 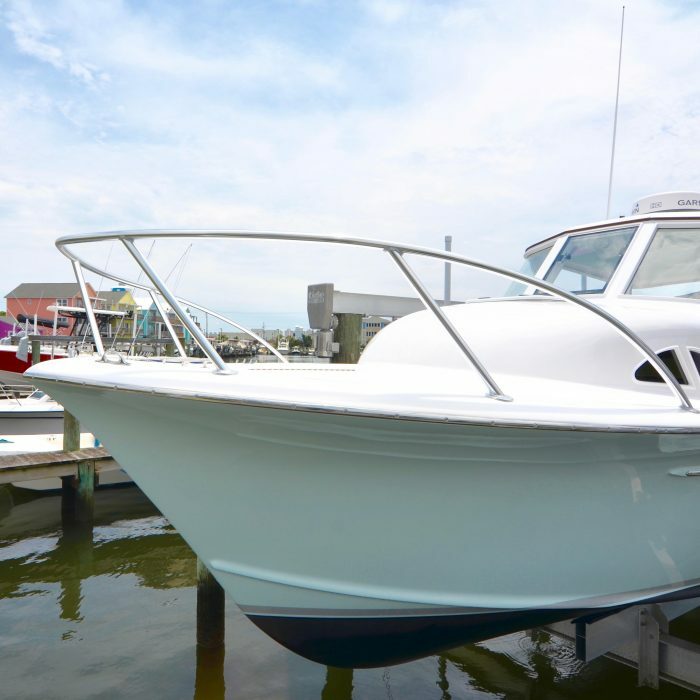 The result is a highly customized and detailed boat that shows our flexibility to meet each of our client’s request while maintaining the utmost detail. 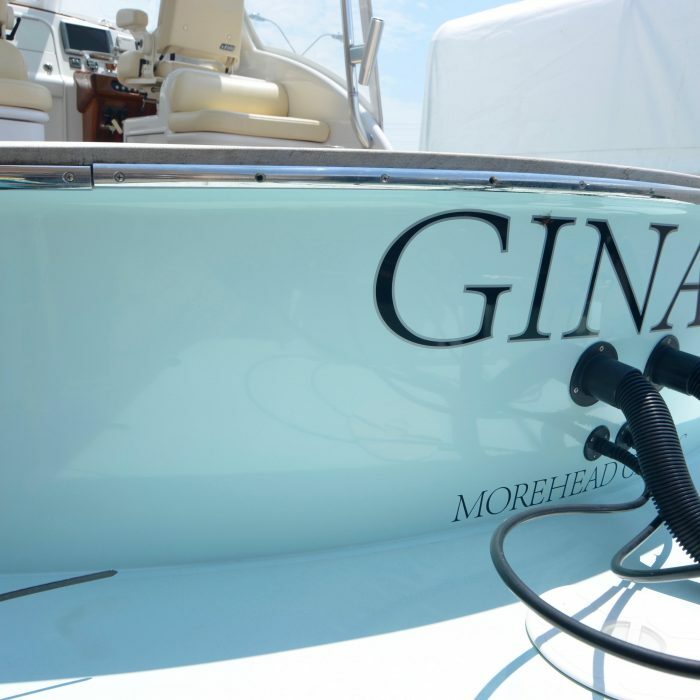 Look for her cruising the waters from Maine to New Hampshire. 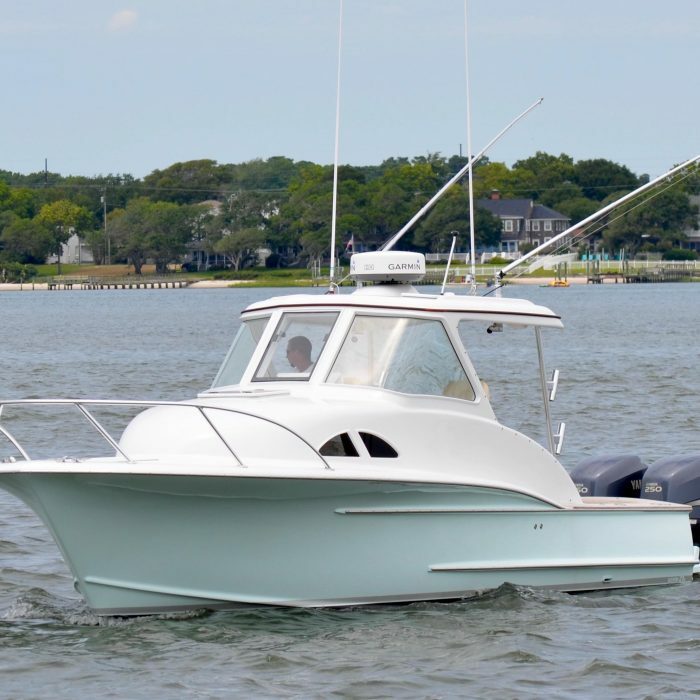 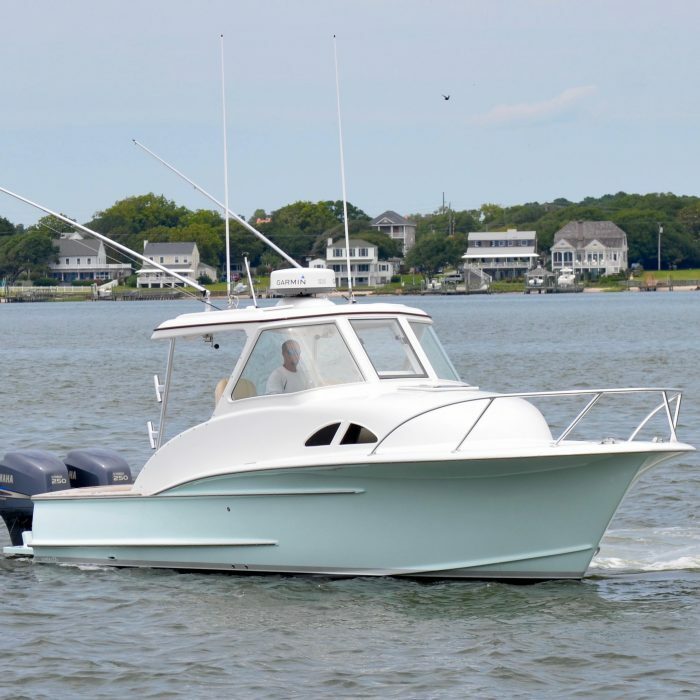 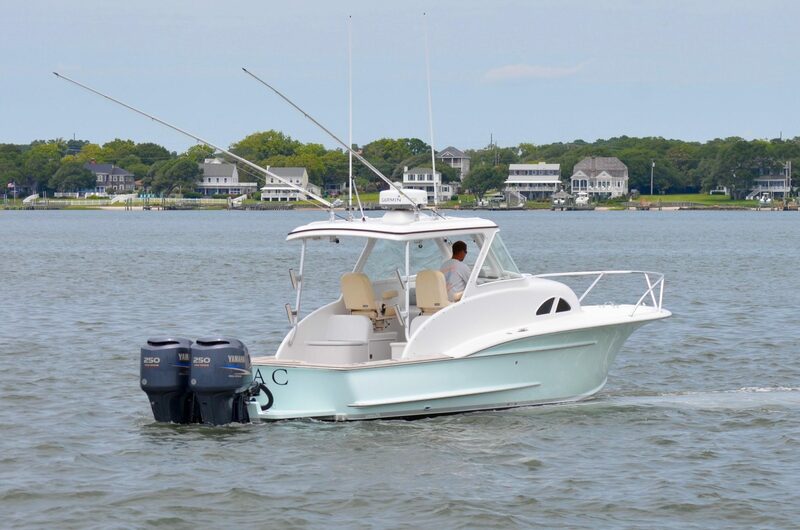 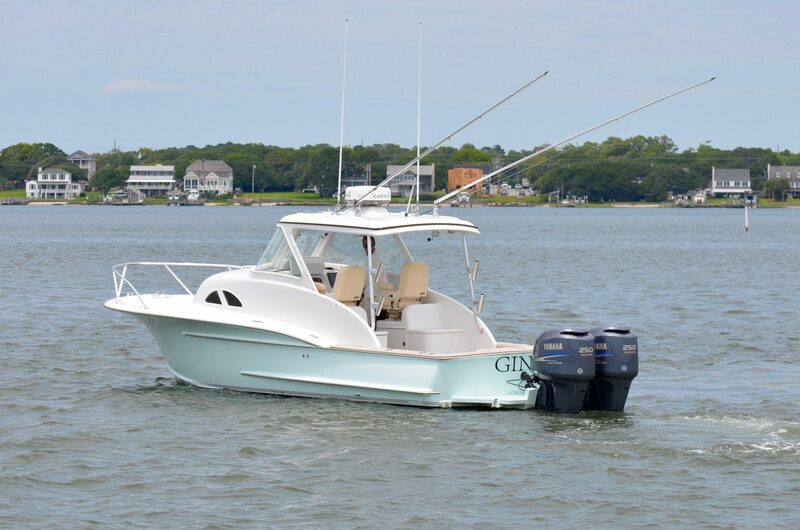 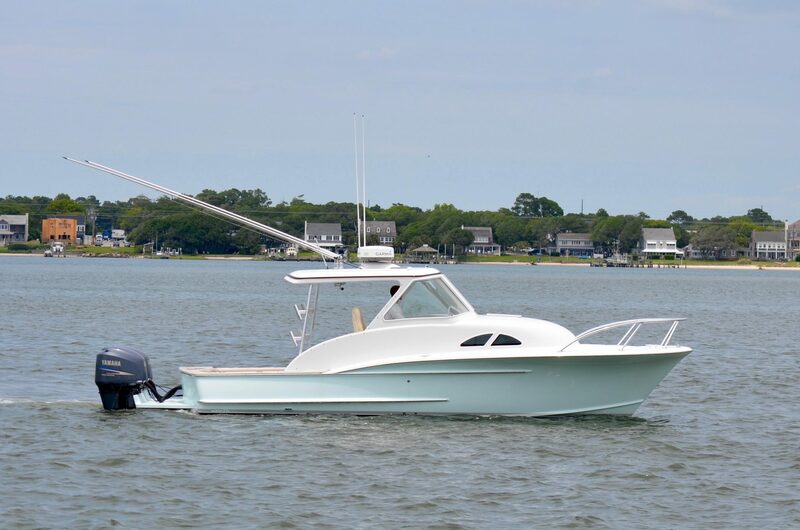 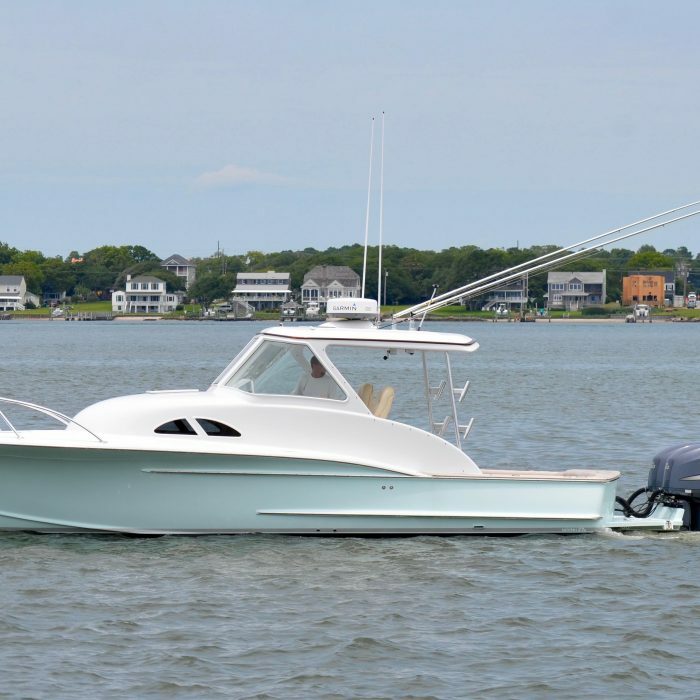 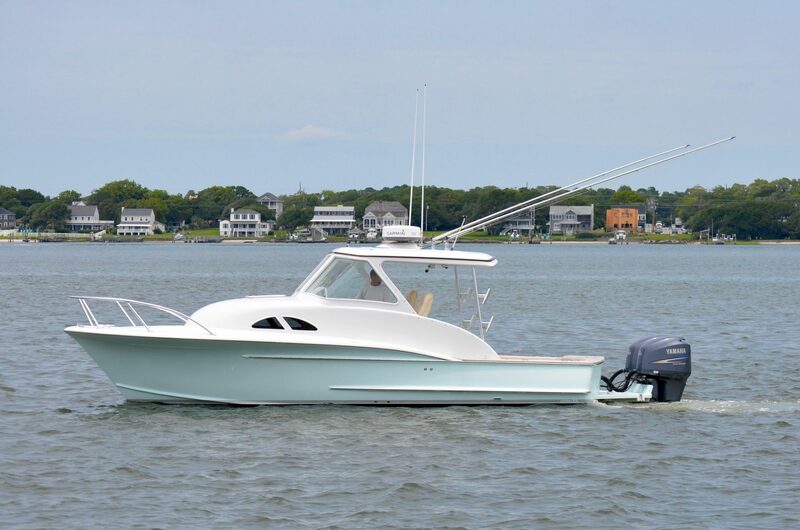 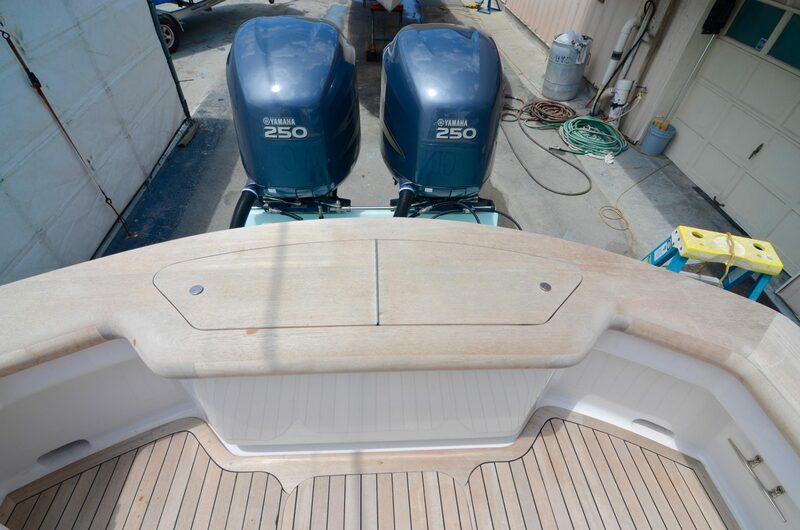 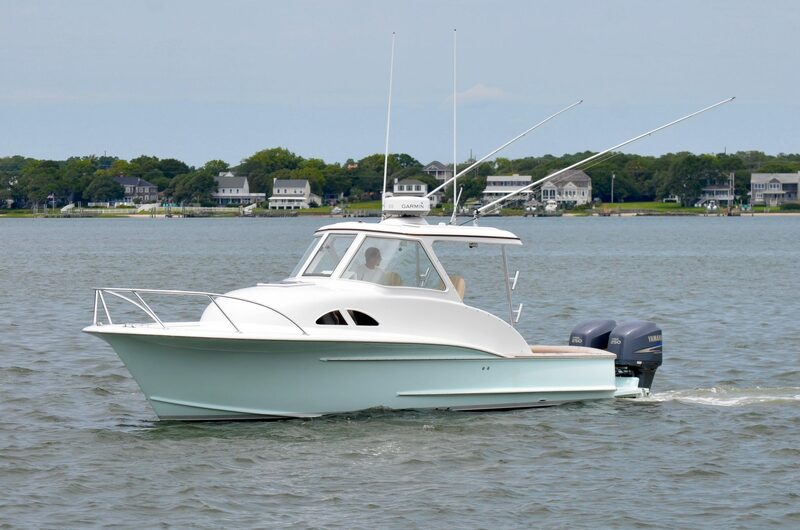 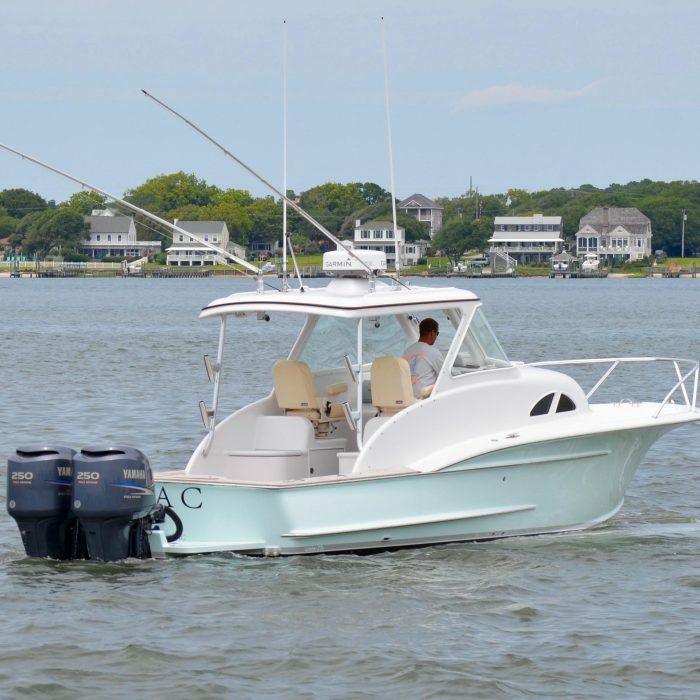 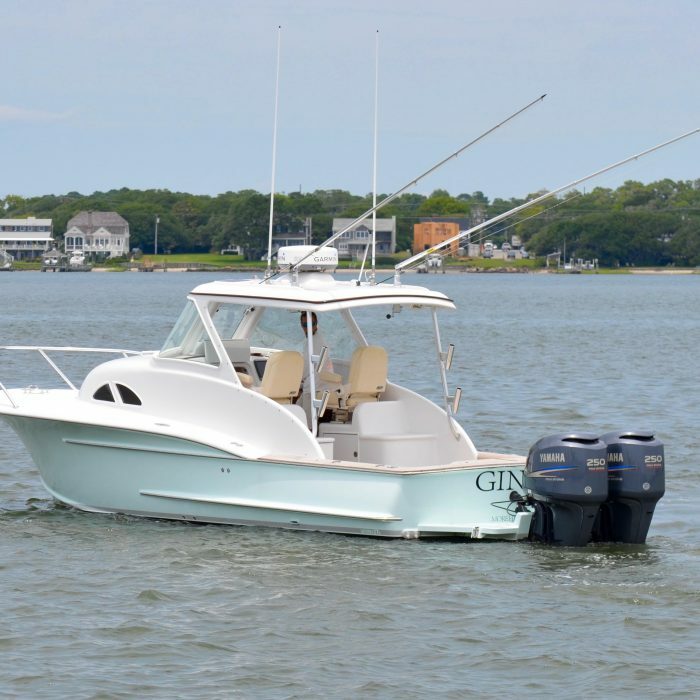 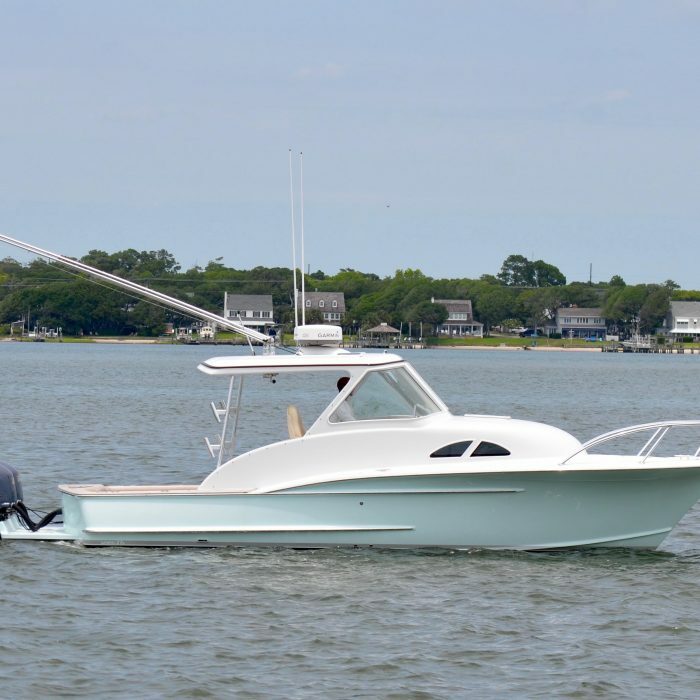 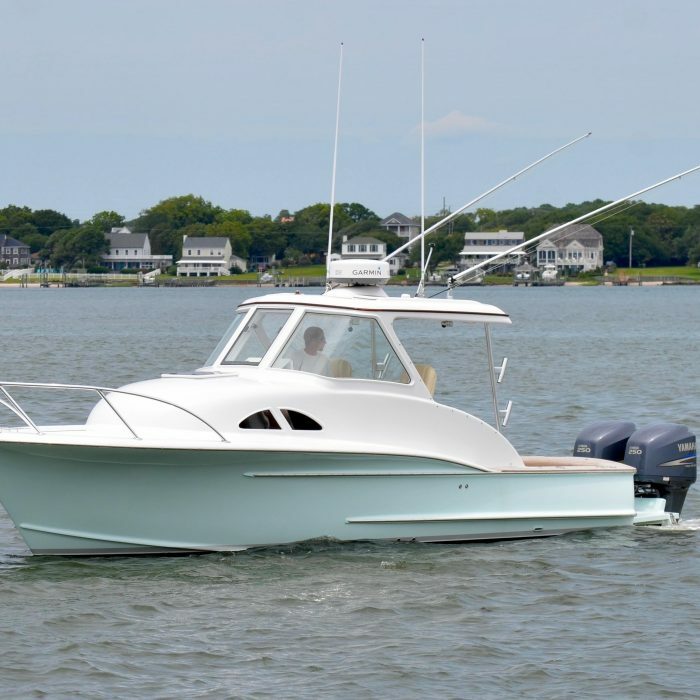 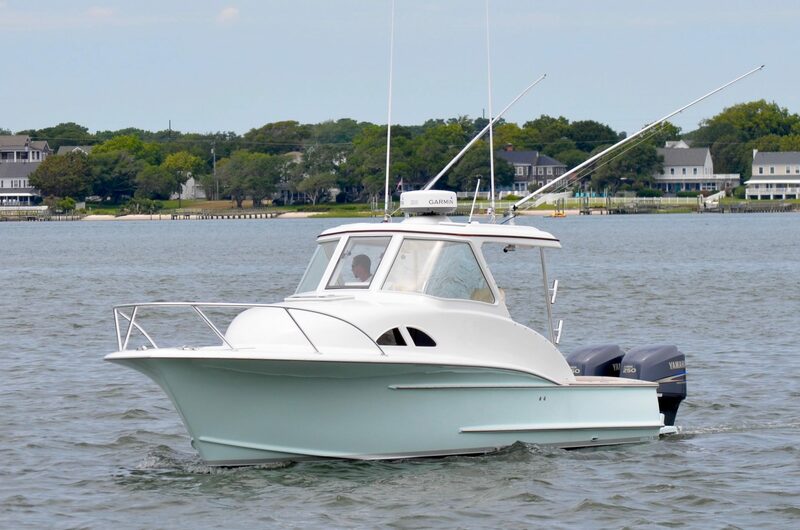 The 27 has many features that set her apart and must be seen to appreciate. 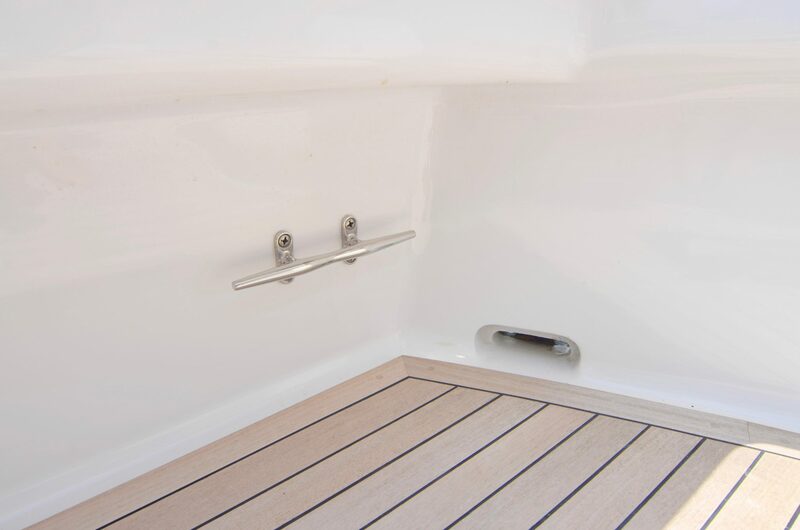 The Rybovich styled bow rail compliments her retro look while offering security when handling bow lines and anchoring. 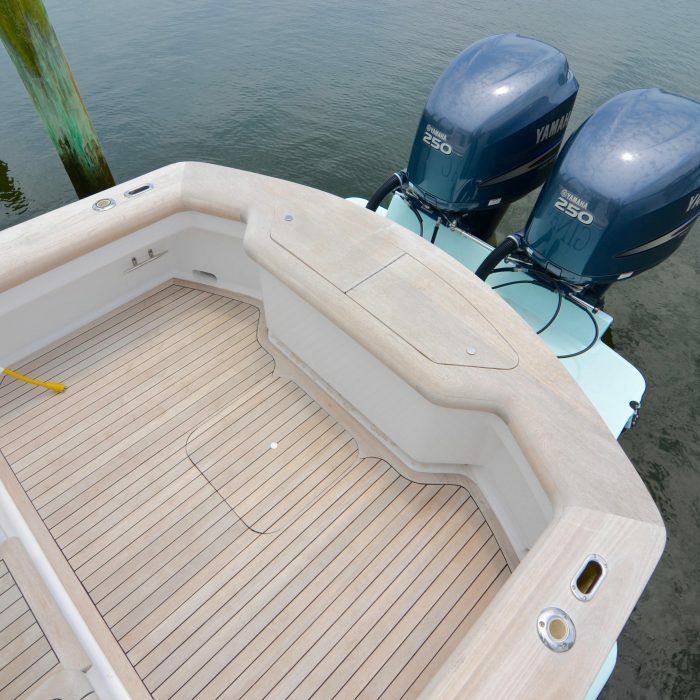 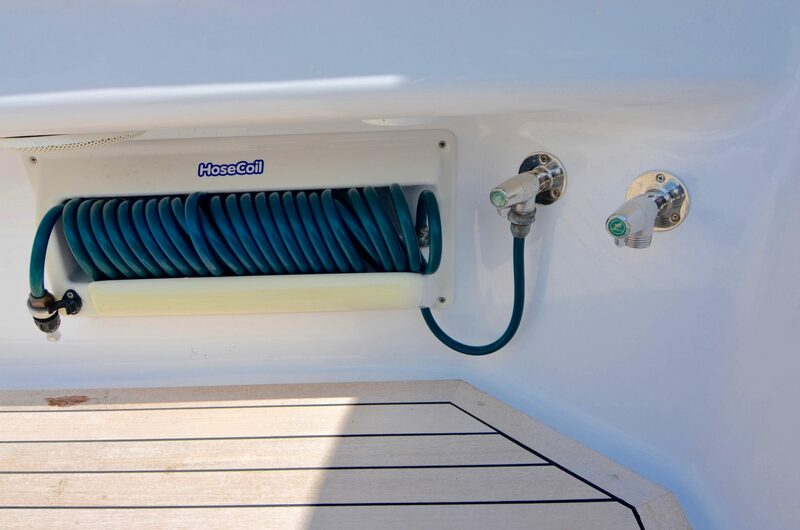 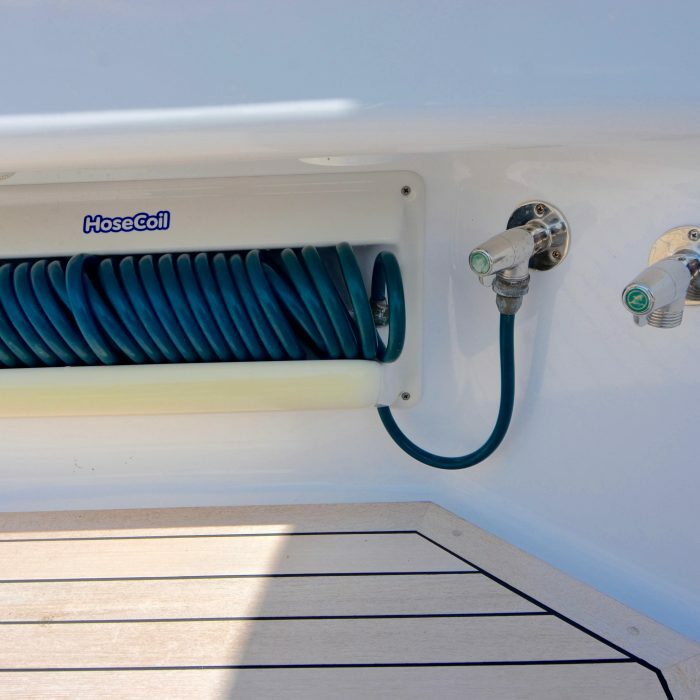 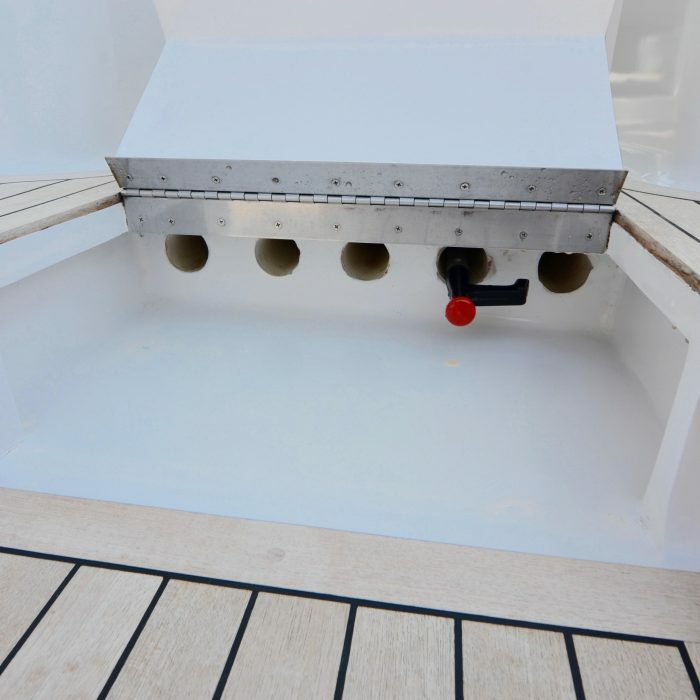 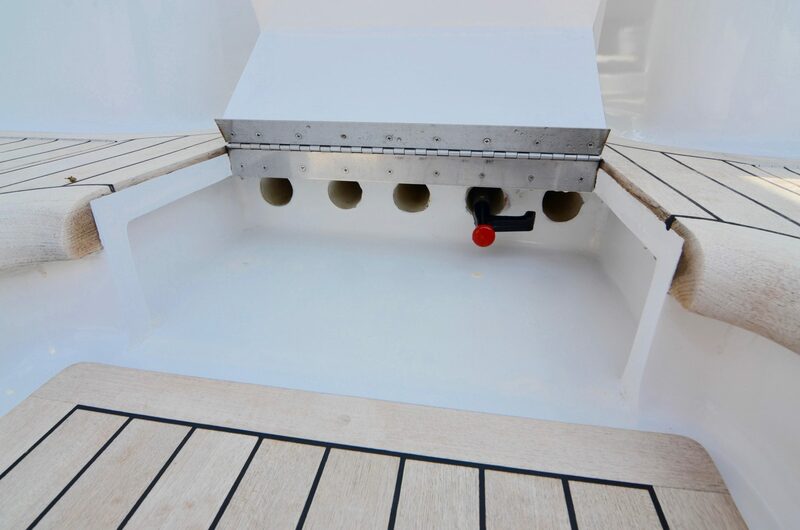 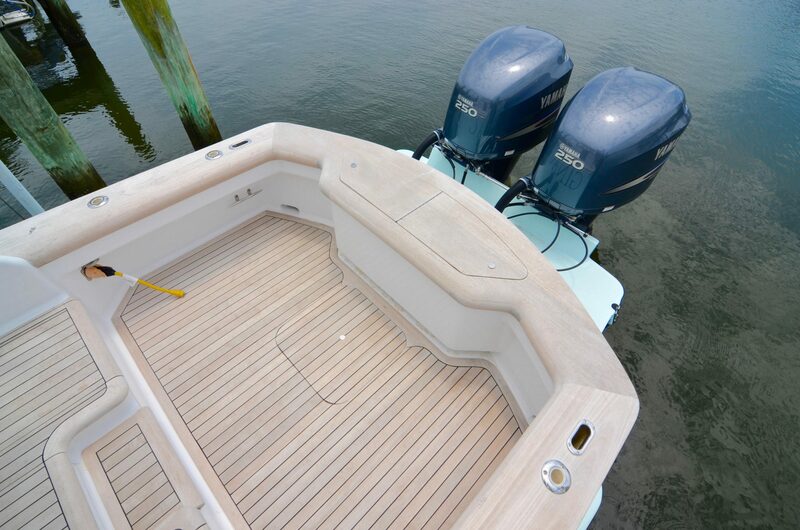 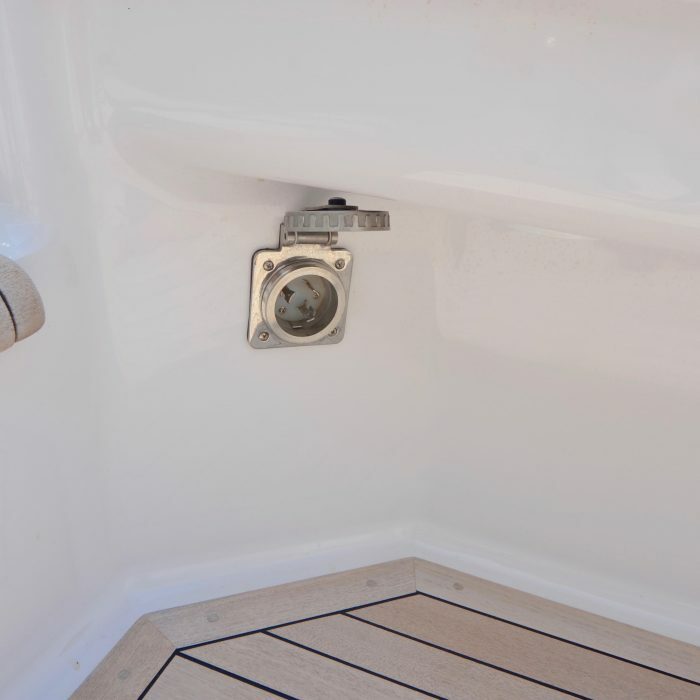 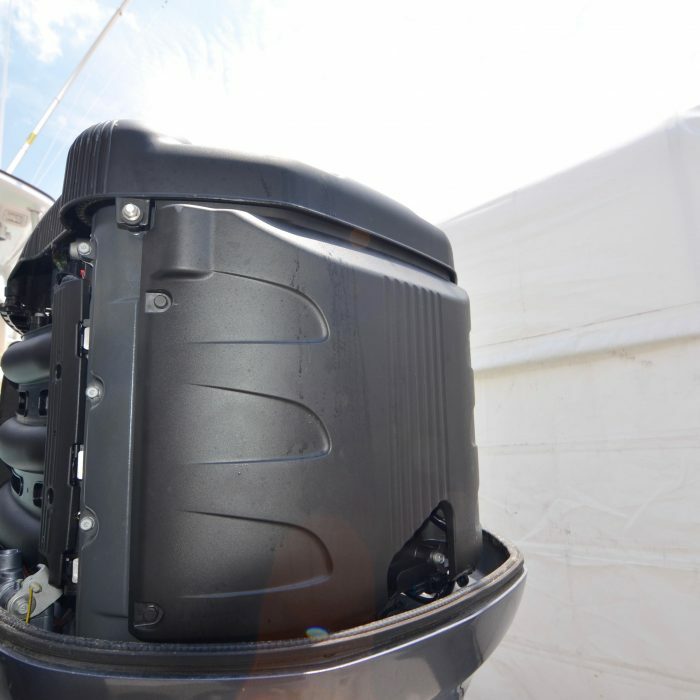 The bow deck is also fitted with an oversized anchor locker for anchor rode, poly balls and dock lines. 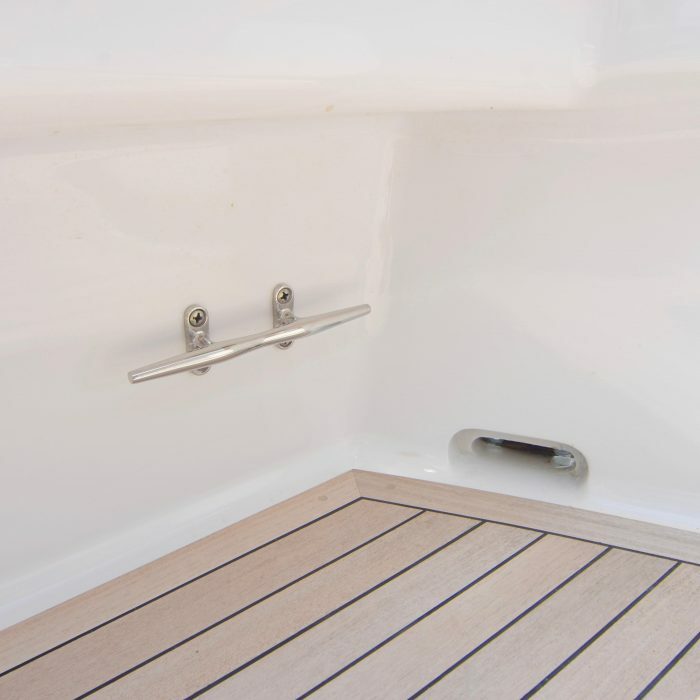 Moving aft alongside of the raised trunk cabin you will find integrated handrails built into the custom hardtop and teak accents along cabin sides. 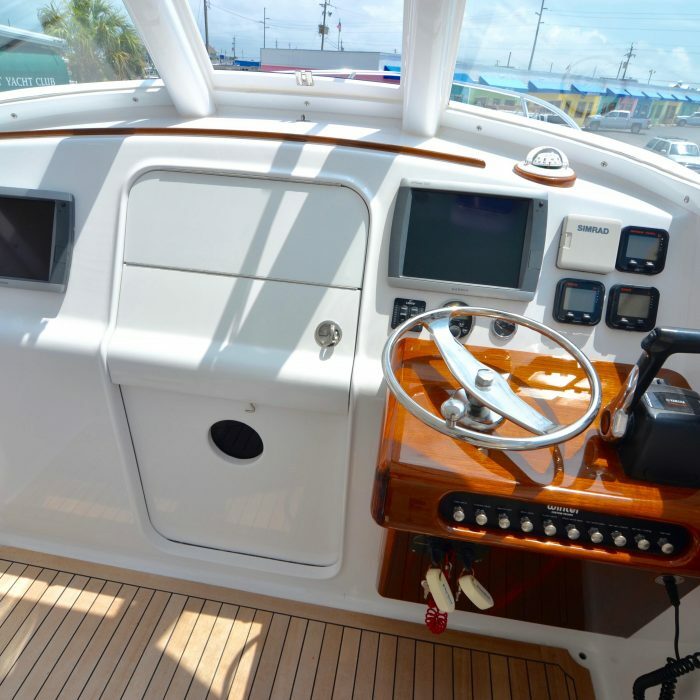 Her cockpit is fitted with full bolster teak covering boards and hand laid teak decks. 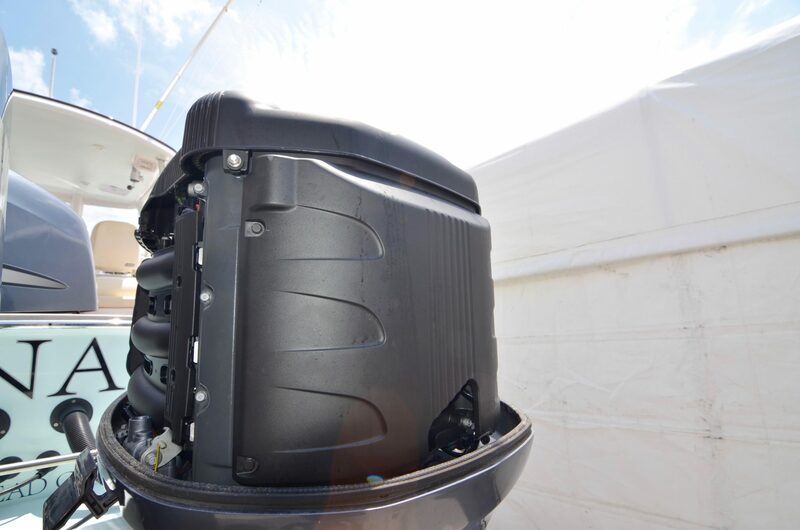 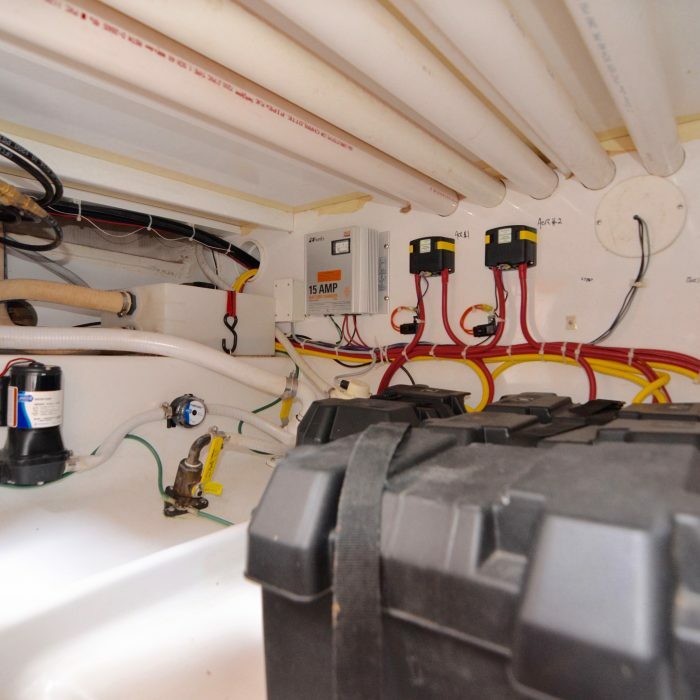 The transom fish box provides fish storage and additional storage while traveling. 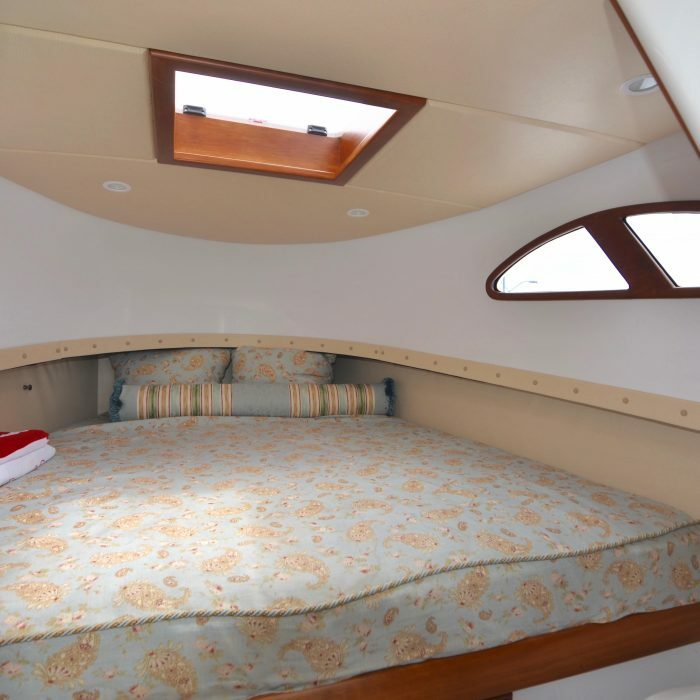 The mezzanine provides additional storage and houses two baitwells. 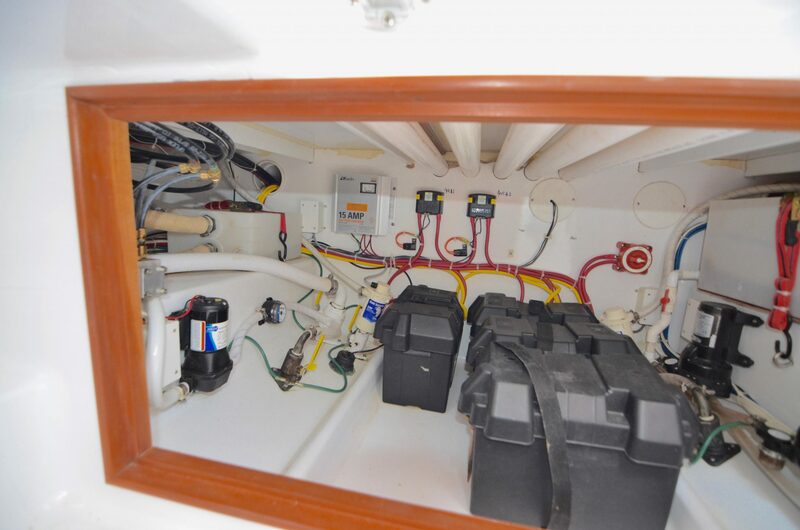 It also includes a compartment for gaff and cleaning supply storage. 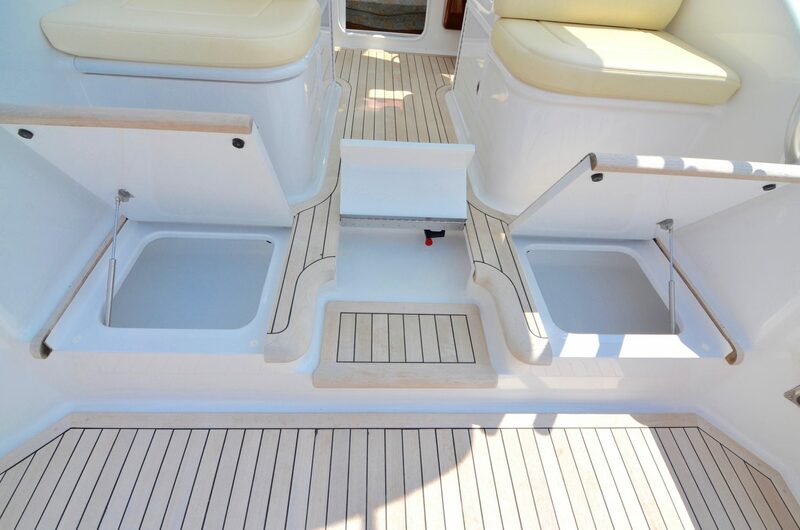 Forward of the mezzanine is double sided seating with additional storage within. 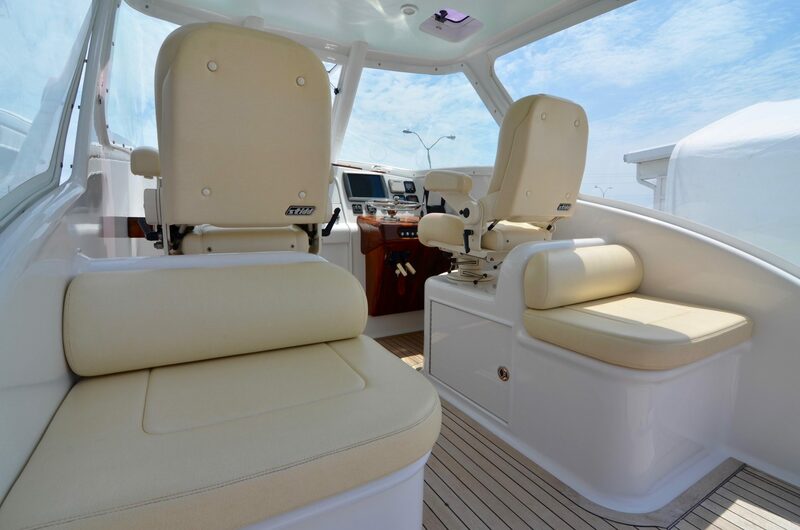 The STIDD helm and companion chairs make you wonder what size boat you are on. 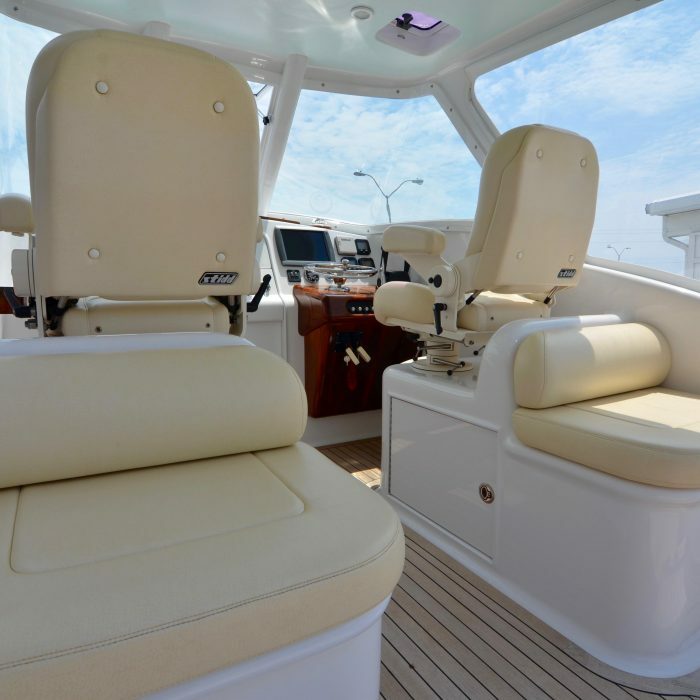 The luxurious seating and ample visibility through the custom compounded glass enclosure is something to be experienced. 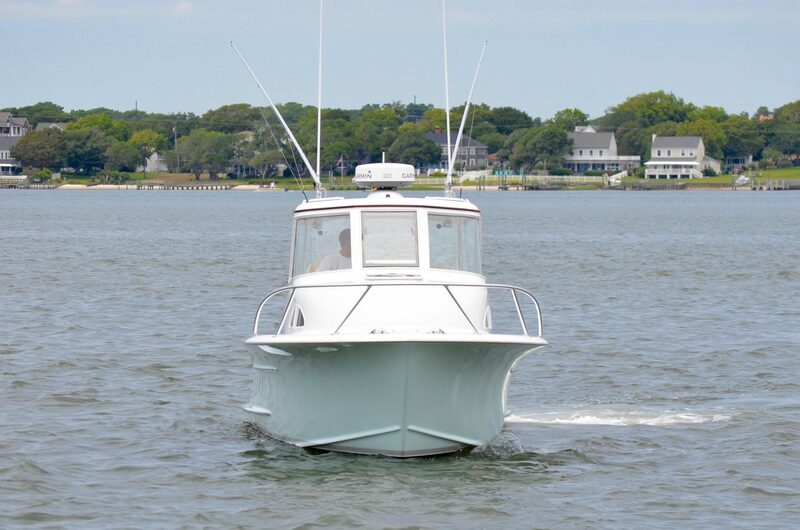 Ventilation is provided through a centerline window that opens and through additional hatches in the hardtop above the helm. 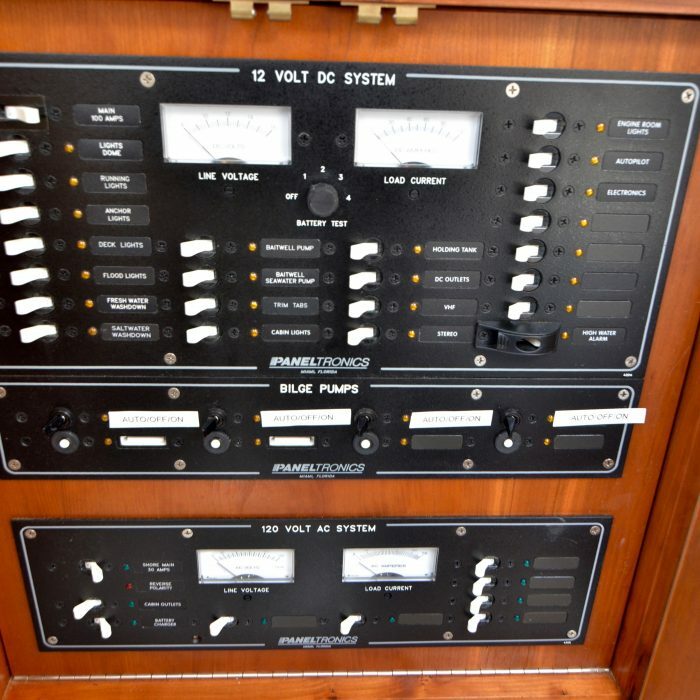 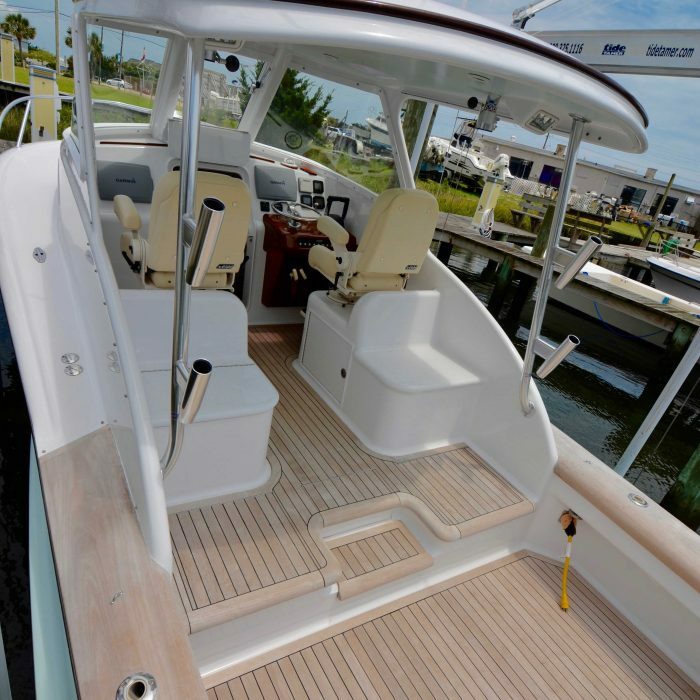 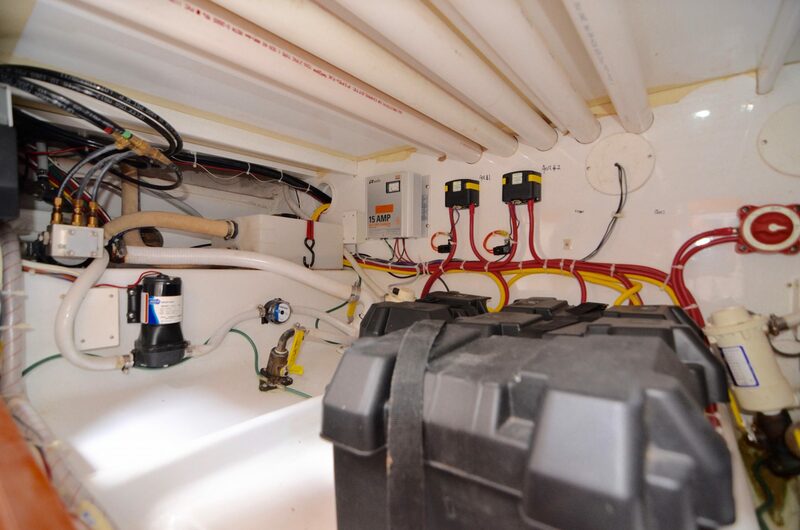 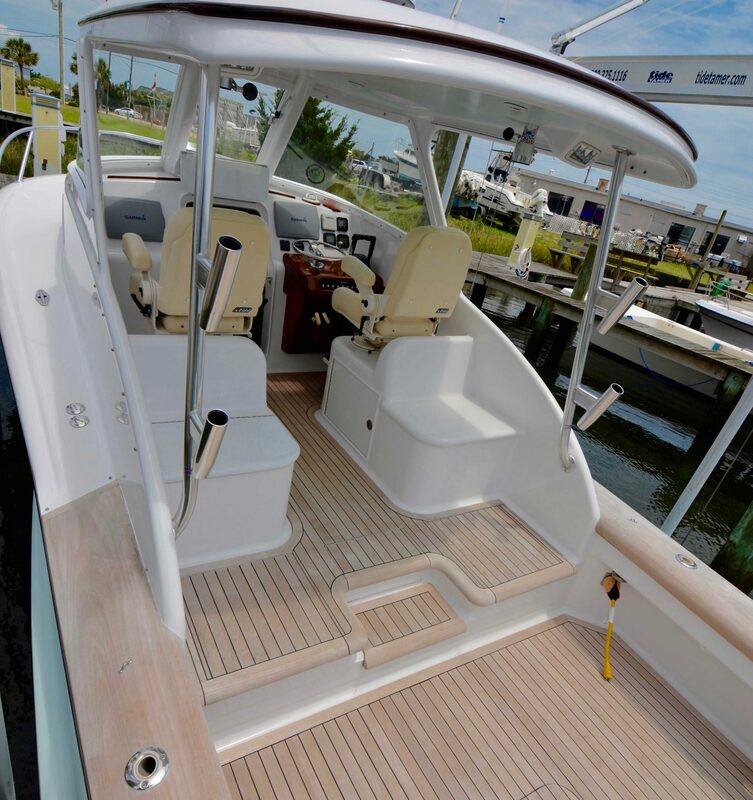 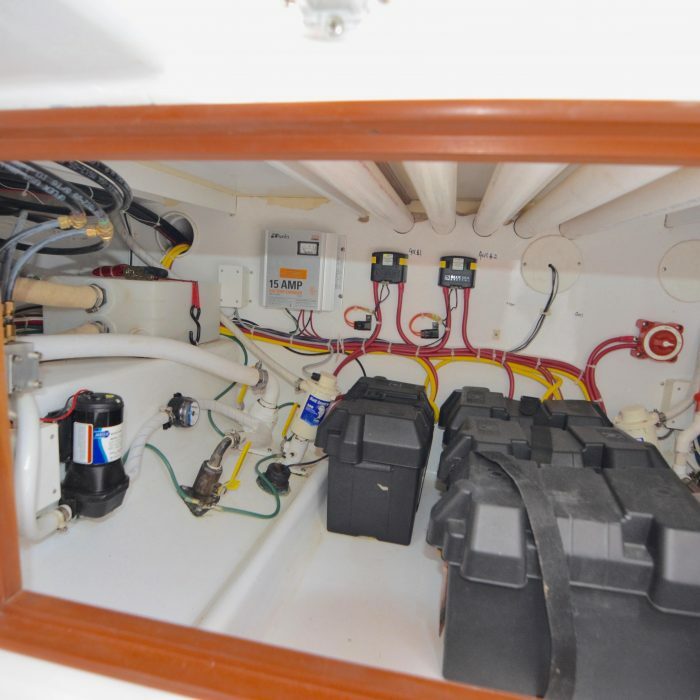 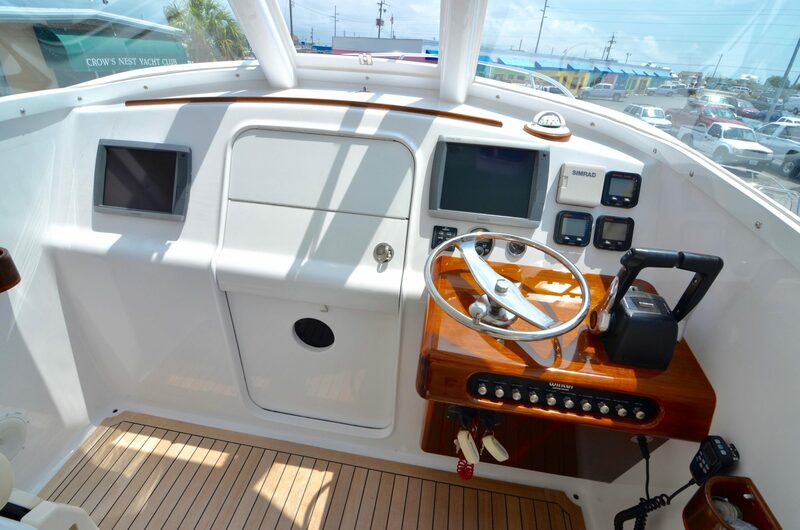 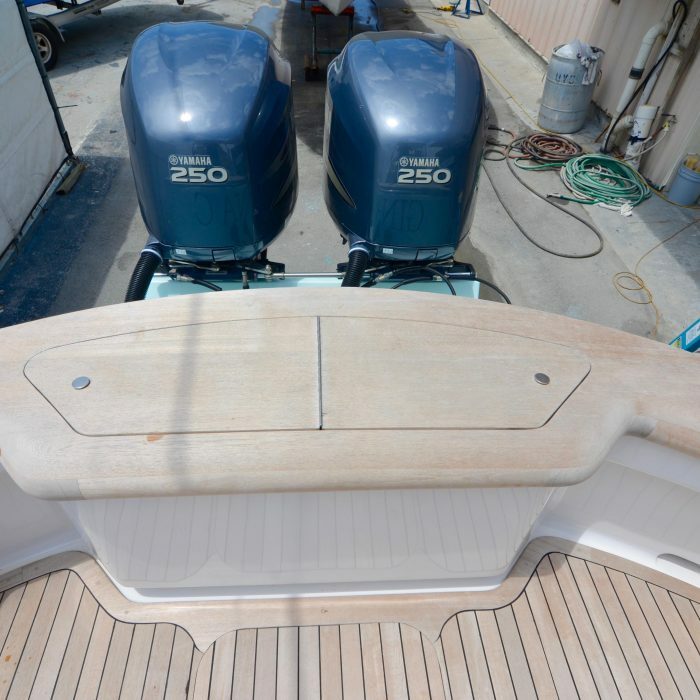 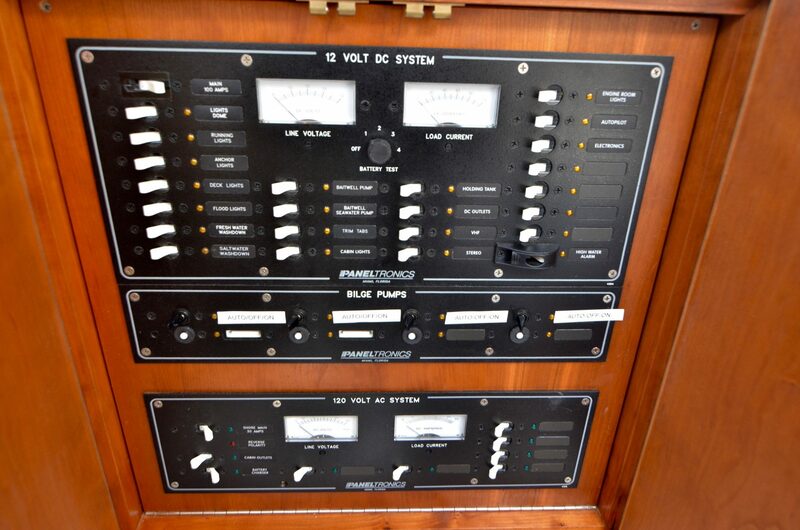 The custom dash panel, teak helm pod, and switch panels make this the ultimate command center for a 27’ vessel. 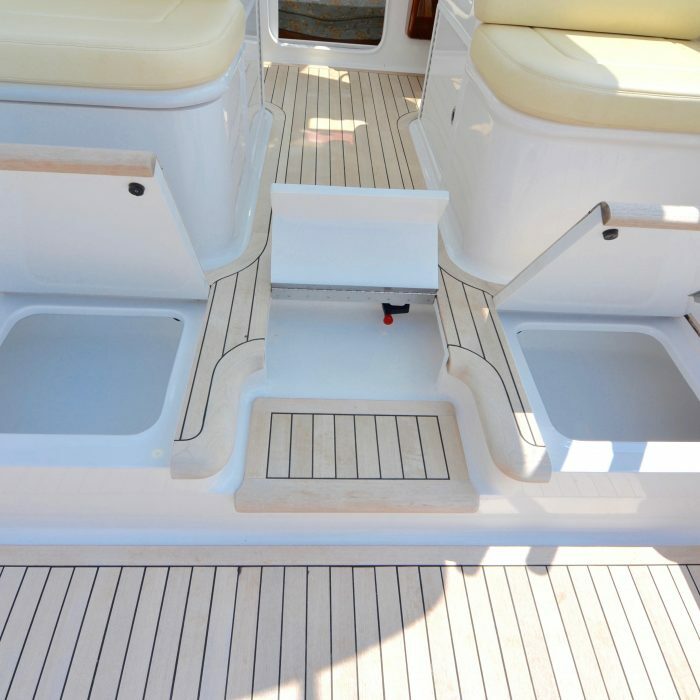 Down below you walk through a sliding and bi folding door from the bridge deck. 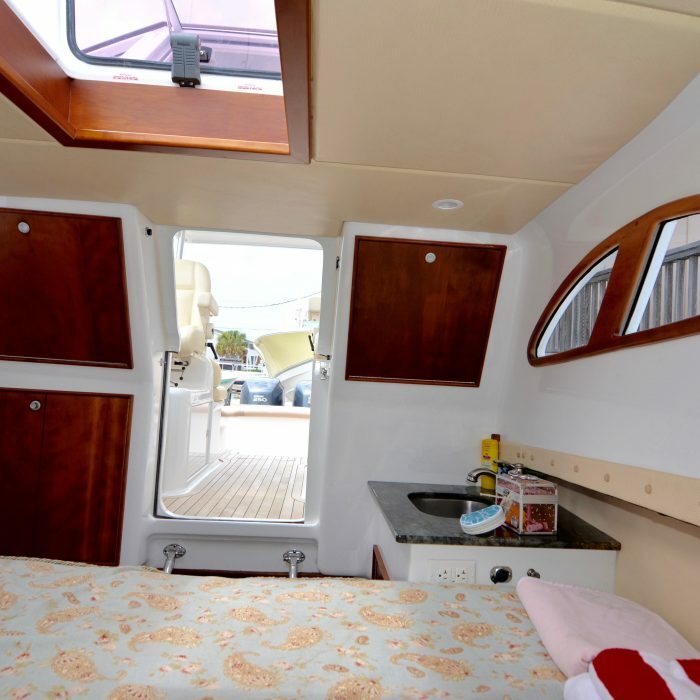 As you enter the cabin down a compact ladder you will find a small galley with sink and microwave to port with custom granite counters. 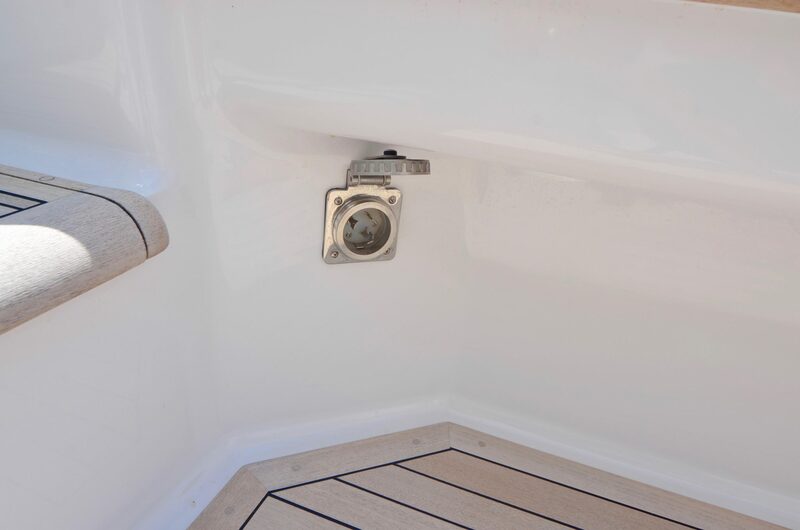 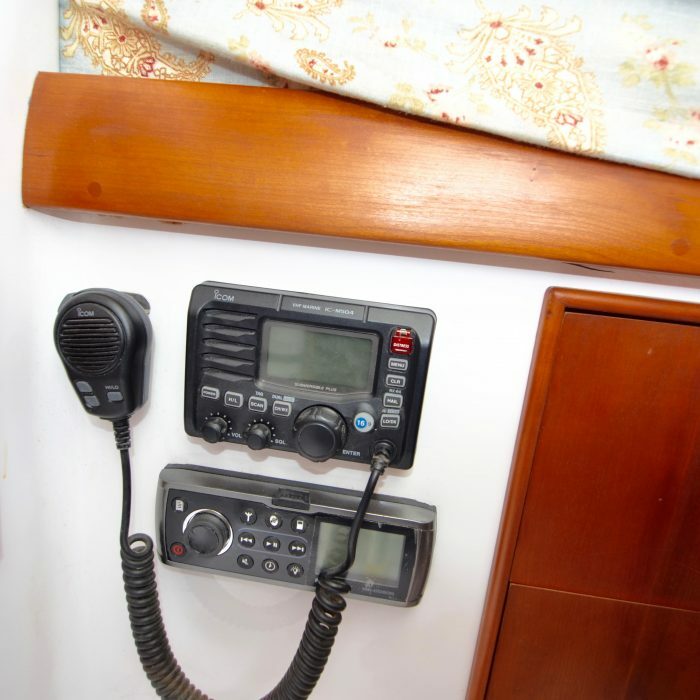 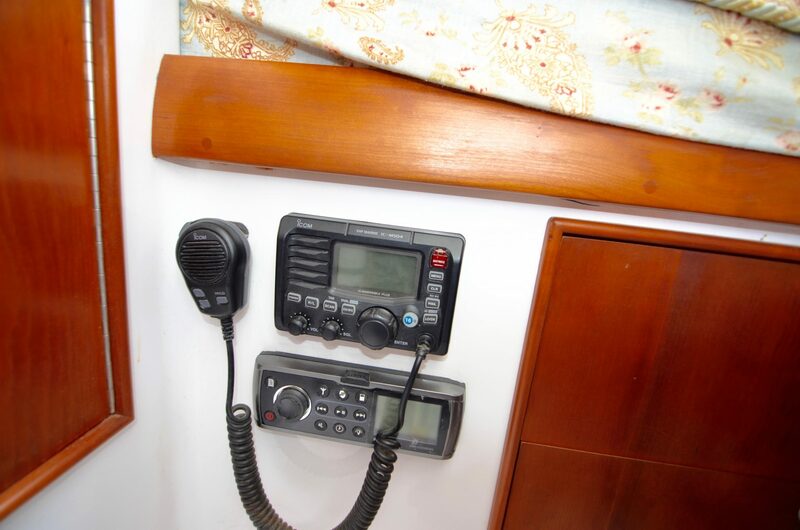 To starboard you have a hide away head and access behind the helm and mechanical items. 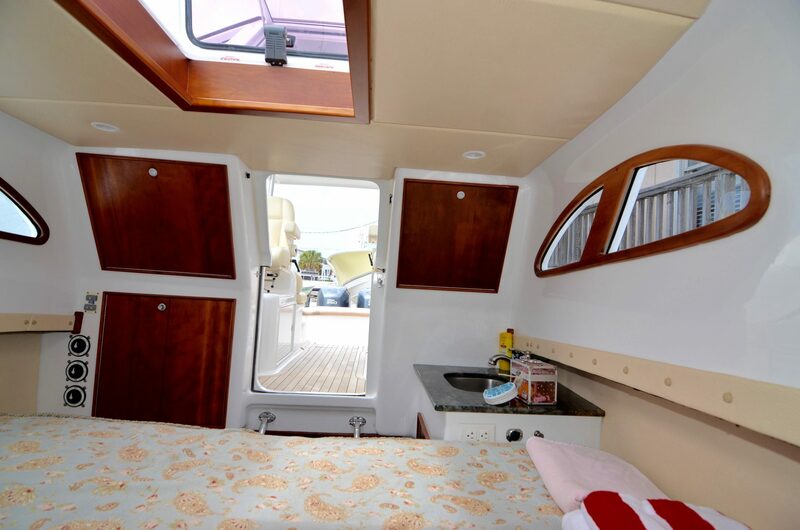 Under the bridge deck looking aft from within the interior, there is a large storage space for additional duffel bags and storage supplies. 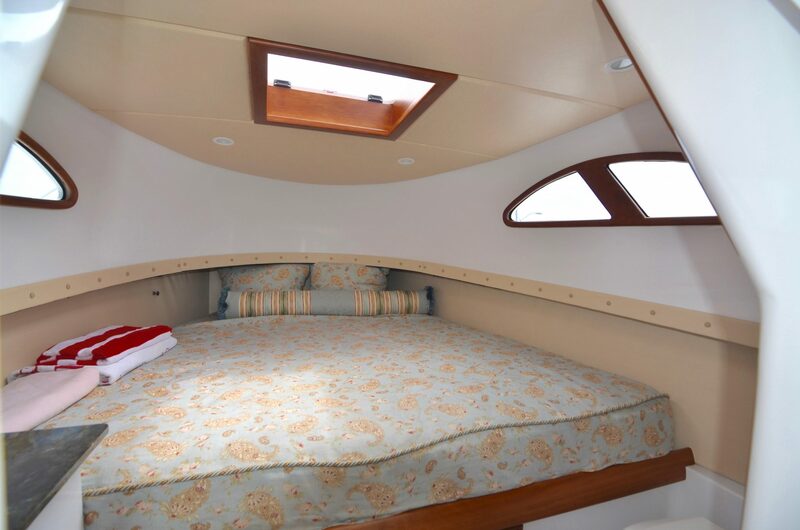 The full-size bed is something found on 60’ models with its ample head room, abundant light, and custom linens.